Infection prevention and control (IPC) is the foundation for preventing the spread of infectious diseases, regardless of source, during medical treatment. Biological attacks will inevitably involve the medical management of sick individuals, which will not only tax the healthcare system, but also highlight the vital importance of infection control. Reducing the capacity for disease transmission will be pivotal in not only the early stages of an outbreak or biological attack, but also during times of crisis. Infection control programs also conduct disease surveillance and reporting to public health departments, which is crucial during an attack or outbreak. Infection control failures, like those in the 2013–2016 Ebola virus disease outbreak and continued Middle East respiratory syndrome (MERS) outbreaks, act as amplifiers for pathogen transmission. In the event of a biological attack, the strength and stamina of a hospital’s infection control program will be critical to early recognition, isolation, treatment, and reducing the spread of infection. Centers for Disease Control and Prevention. Bioterrorism agents/diseases. 2017. https://emergency.cdc.gov/agent/agentlist.asp. Accessed 7 Apr 2017. Centers for Disease Control and Prevention. Clean hands count for healthcare providers. 2017. https://www.cdc.gov/handhygiene/providers/index.html. Accessed 19 May 2017. Centers for Disease Control and Prevention. Standard precautions for all patient care. 2017. https://www.cdc.gov/infectioncontrol/basics/standard-precautions.html. Accessed 19 May 2017. Centers for Disease Control and Prevention. Handwashing: clean hands save lives. 2017. https://www.cdc.gov/handwashing/show-me-the-science-hand-sanitizer.html. Accessed 16 June 2018. California Department of Public Health. Reportable diseases and conditions. 2017. https://archive.cdph.ca.gov/HealthInfo/Pages/ReportableDiseases.aspx. Accessed 10 July 2017. World Health Organization. Five moments for hand hygiene. 2006. http://www.who.int/gpsc/tools/Five_moments/en/. Accessed 19 May 2017. Association for Professionals in Infection Control and Epidemiology – APIC. Rules for standard and isolation precautions. 2017. http://professionals.site.apic.org/10-ways-to-protect-patients/follow-the-rules-for-isolation-precautions/. Accessed 3 April 2017. World Health Organization. Evidence of hand hygiene to reduce transmission and infections by multi-drug resistant microorganisms in healthcare settings. http://www.who.int/gpsc/tools/Five_moments/en/. Accessed 19 May 2017. World Health Organization. WHO MERS-CoV global summary and assessment of risk. 2017. http://www.who.int/emergencies/mers-cov/risk-assessment-july-2017.pdf?ua=1. Accessed 28 July 2017. Munoz-Price I, et al. SHEA expert guidance: isolation precautions for visitors. Infection control & hospital epidemiology. 2015. https://shea-online.org/index.php/practice-resources/41-current-guidelines/422-expert-guidance-isolation-precautions-for-visitors. Accessed 2 Aug 2017. Centers for Disease Control and Prevention. Infection prevention and control recommendations for hospitalized patients under investigation (PUIs) for Ebola virus disease. 2015. https://www.cdc.gov/vhf/ebola/healthcare-us/hospitals/infection-control.html. Accessed 4 Feb 2017. Centers for Disease Control and Prevention. Guidelines for isolation precautions: preventing transmission of infectious agents in healthcare settings. 2007. https://www.cdc.gov/infectioncontrol/guidelines/isolation/prevention.html. Accessed 2 May 2017. Vastag B. Superbug stalked NIH hospital last year, killing six. The Washington Post. 2012. https://www.washingtonpost.com/national/health-science/superbug-stalked-nih-hospital-last-year-killing-six/2012/08/22/5be18b1a-ec66-11e1-9ddc-340d5efb1e9c_story.html. Accessed 28 July 2017. Lax S, et al. Bacterial colonization and succession in a newly opened hospital. Sci Transl Med. 2017;9(391) https://doi.org/10.1126/scitranslmed.aah6500. Centers for Disease Control and Prevention. SARS, infection control in healthcare facilities. 2005. https://www.cdc.gov/sars/guidance/i-infection/healthcare.html. Accessed 14 July 2017. Sun L. Cost to treat Ebola in the U.S.: $1.16 million for two patients. The Washington Post. 2014, November 18. https://www.washingtonpost.com/news/post-nation/wp/2014/11/18/cost-to-treat-ebola-in-the-u-s-1-16-million-for-2-patients/?utm_term=.e6a9091e93d8. Accessed 29 Jan 2017. Hayden E. Biodefense since 9/11: the price of protection. Nature. 2011; 477:150–152. http://www.nature.com/news/2011/110907/full/477150a.html. Accessed 30 July 2017. Association for Professionals in Infection Control and Epidemiology – APIC. Ebola preparedness one year later: a poll of APIC members. 2015. https://apic.org/Resource_/TinyMceFileManager/Topic-specific/APIC_Ebola_Survey_Results_November_2015.pdf. Accessed 15 Aug 2017. Blue Ribbon Study Panel on Biodefense. Recommending and promoting changes to U.S. policy and law to strengthen national biodefense while optimizing resource investments. 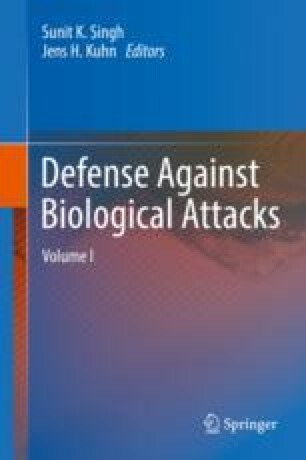 2015. http://www.biodefensestudy.org/. Accessed 8 July 2017. Johns Hopkins University Center for Health Security. Health sector resilience checklist for high-consequence infectious diseases – informed by the domestic US Ebola response. 2017. http://www.centerforhealthsecurity.org/our-work/pubs_archive/pubs-pdfs/2017/HCID_Final_Report_05.23.2017.pdf. Accessed 22 June 2017. Occupational Safety and Health Administration. Ebola: control and prevention. https://www.osha.gov/SLTC/ebola/control_prevention.html. Accessed 8 July 2017. World Health Organization. Standard precautions in healthcare. 2007. http://www.who.int/csr/resources/publications/EPR_AM2_E7.pdf?ua=1. Accessed 19 May 2017.